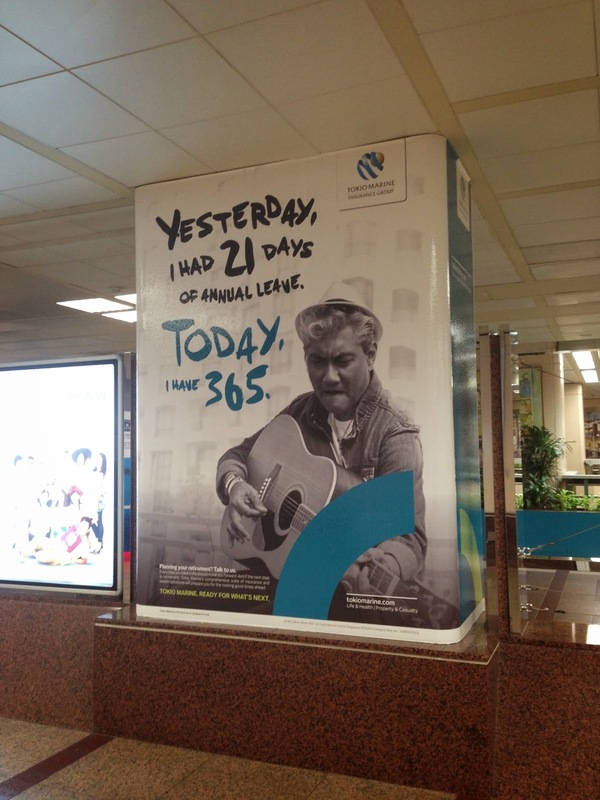 When I went to the gym at Raffles Place last week, I was pleasantly surprised to see the station covered with Tokio Marine's ad and with each passing panel, I was more in love with the whole campaign! 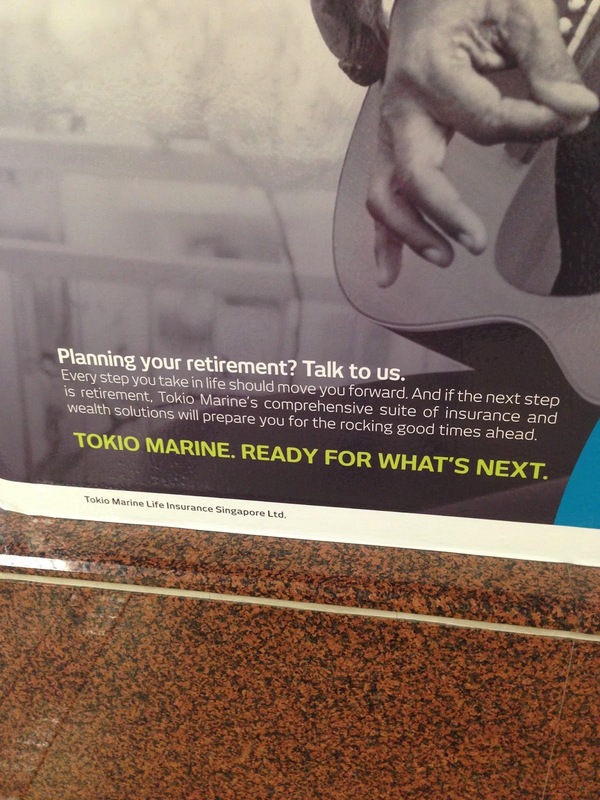 Well done Tokio Marine! You've successfully managed to shed your stuffy Japanese image and gotten a little personal with your audience. Heard from my media agency that the Japanese HQ has mandated the similar campaign worldwide so the regional offices had no choice but to follow. Which made me even more surprised because I felt the people in the ads looked more Singaporean than Japanese! Anyway, this is the perfect ad campaign to demonstrate certain elements of what makes up a Good Advertisement. Specifically, the new trend of more emotional soft sell. The whole series were about individual needs that are relatively universal - life events such as retirement, setting up one's business, starting a family or owning a car. All these are events that one would probably go through in one's life journey. They also chose to have a font that looks more like a person's handwriting to convey a more personal touch. They kept the serious, straight fonts only for their contact details and corporate sale spiel. The ads were personable too, with words such as 'I' and 'us'. Tells the audience what Tokio can do for a person rather than what's so great about themselves/their product(s). You don't have to read the whole paragraph but notice on the "Talk to us." and "Ready for what's next." These 2 are very clear and personable taglines and personifies the company. 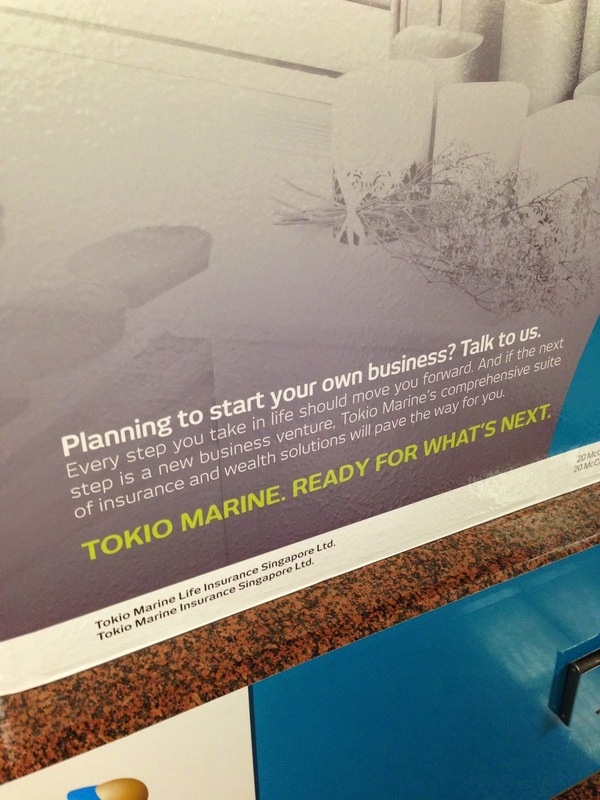 My only gripe would be that I wished there was a url or telephone number because I'm not sure whether I should Google "Tokio Marine" to find out their contact details to talk to them or what as not all their posters had the url. They also played on people's aspirations to own their own businesses or cars in their main titles, such as "Yesterday, I answered to my boss. Today, I answer to my customers." It's a little subtle but the models used in this campaign were a mix of races. Spotted someone who looked a little Malay and another few more Chinese. These faces are a lot more catered to the Singaporean audience, plus their relaxed poses makes the ads a lot less forgettable for an Insurance ad. 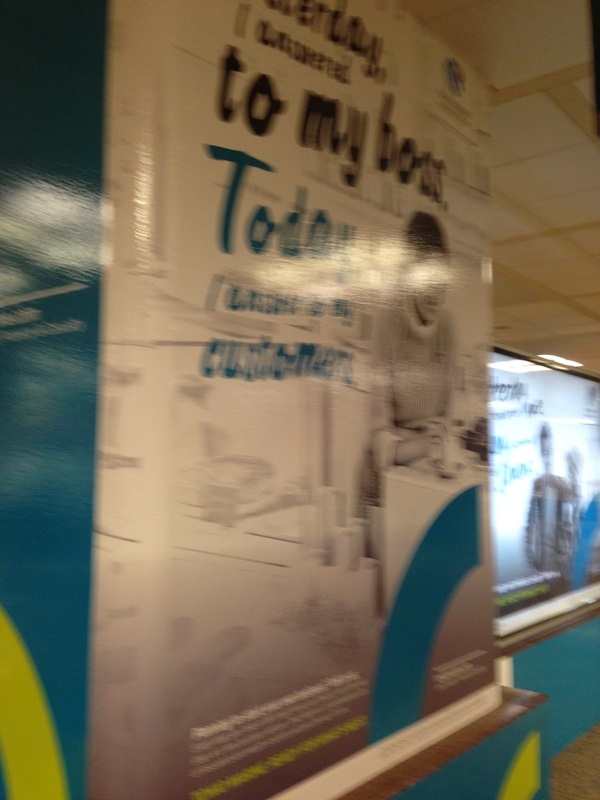 They kept to the same colour scheme and the running "Yesterday...Today,..." tagline where they juxtaposition various scenarios for all their ads. This helps in brand recall and you will definitely recognise their corporate colour the next time you see it (think Scoot = Yellow; Tiffany = that shade of blue; Coca Cola = Red etc). They even have that odd blue arc at the bottom corner on every single poster with their contact details under it. I'm sure that there are reasons why these ads aren't perfect but please...let's give a hand to Tokio Marine and their ad agency. It is NOT easy to book the slots for the posters, turnstiles AND the bottom walls of not just 1 but 2 stations (friend told me that she saw the same ads in Newton MRT station) to show the ad AT THE SAME TIME PERIOD. Estimated cost? S$300k. Excluding production and design. SMRT doesn't do bulk discount. Oh...and I saw the ad adaptation on taxis but couldn't snap any pictures because it zoomed past me. So...that's probably another $50-60k, depending on how many taxis have the ad.